I recently purchased some greens powder that was recommended by Green Smoothie Girl . (I purchased it on sell for about $45 at Good Earth). She likes it because it has a minty flavor, and it's a little easier to digest and it doesn't have any of the fillers like some of the other green powders out there. I have to tell you, the first couple of times, the gag reflex was trying it's best to reject, but I kept trying. I added a little less the 3rd time (should have added less the 1st time, lol) and it was MUCH more drinkable. I have to say, now that I am used to it, I can gulp it down pretty quickly. So my advice, if you do try this product, start small and add more after you get used to the taste. You can also just mix it in with your smoothie or just add it to water like I do. Click HERE for more info. The ingredients include: Oat grass; barley and wheat grass; alfalfa; yucca; parsley; spinach; probiotic culture; peppermint; whole-leaf stevia (sweetener). 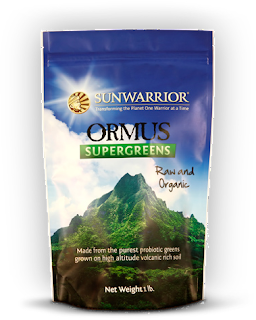 "This is the highest vibration greens product in the world, grown organically in a pristine ancient sea bed in a volcanic region of Utah and Arizona. The soil is loaded with platinum, gold, silver and ormus trace minerals that give the greens a magnetic property that increases the vibration and frequency of those who consume it." It’s summer and summertime means smoothies . . . great smoothies! I think we can all agree that there are few things better on a hot summer day than a delicious, cold smoothie. Great smoothie recipes like yours need to be shared and properly admired. It is time for all smoothie lovers to come together to honor the best that smoothies have to offer! Let the genius of your smoothie creation shine for all to enjoy! It is our honor at Sunwarrior to introduce our Smoothie competition. It is a forum for all of you secret smoothie geniuses to show off your skills and receive the recognition you deserve. The Rules of the competition are very simple. The Rules of the competition are very simple. · Since Sunwarrior is sponsoring this competition, recipes should use at least one Sunwarrior product. · First, take an attractive picture of your completed smoothie. · Then, post that picture on Sunwarrior’s Facebook wall with your full name and recipe in the caption. · Sunwarrior will compile entries into an album where all the voting will take place. · Finally, get your friends to go on Sunwarrior’s Facebook page to vote for your recipe by “liking” it! Hint* Once the Smoothie album is compiled on August 1st tag yourself in the Smoothie Contest album so that your entry will count…and so all your friends can easily find your recipe. Winners will be determined by the amount of votes (Like’s) they receive. The recipe with the most votes (Likes) wins! If you know that your recipe is the best, make sure you tell your friends to vote for you! Don’t be shy, competition will be fierce and the prizes awesome. · The top 5 winning recipes will receive a Sunwarrior T-shirt and Sunwarrior shaker bottle plus 3 free products of their choice! · The “Smoothie Genius of the Year” or overall winning recipe will receive a Sunwarrior T-shirt and Sunwarrior Shaker bottle plus a 6 month supply of Sunwarrior product! · With so much on the line being a part of our smoothie E-book and the incredible prizes - you will not want to miss this opportunity. Join us as we search for the world’s best smoothie recipe . . . it could be yours!